Thanks to the change of clocks here in Europe, the period during which I had a chance to lie down last night, from 1 to 6 a.m., was only four hours. So when I got up I was even more intent than usual on getting some coffee. But I must not have been very awake when I was on my way to get it, because I had no response for the friar who gave me the classic paschal greeting: Christos anesti! Yesterday I went out for my walk. As I usually do when I have some, I offered treats to the feral cats that hang around outside the kitchen. The folks who work in the kitchen seem to feed them, more or less, leaving them this or that: chicken scraps, rabbit heads, old gnocchi. Perhaps they do it out of kindness or perhaps because cats hanging around the kitchen are better than rats. All the usuals were there yesterday--the big, grizzled, black and white tom I've come to call 'Big Meanie,' the one-eyed calico, the tabby that's funny-looking in some way I can't articulate. They seemed hungrier than usual. Then I realized; they must suffer somewhat on fast and abstinence days when there's not much to be cooked in the kitchen. Having now lived through two fast and abstinence days here in Italy, I can now share with confidence what one eats on them. For the main meal in the middle of the day, you get a bowl of vegetable soup. That's it. For supper, there's spaghetti (with just a little oil and garlic) and scrambled eggs. I share this partly because of certain recent disappointments I've had with the press. How can you interview someone about having an intimate Holy Thursday lunch with the Pope and not ask him what he got to eat? And if you did ask, how can you leave it out of the article? There's a little Manichean in all of us, friends, of whom we need to beware. The heresy can be subtle and is very seductive. Just watch Star Wars. He's right, of course. But how much easier it is to live in a world of conditional and transactional love, of doing to others as they do unto me, of helping out those who have been helpful to me, of doing good in the hopes that it will dispose others to help me in the future. And how much easier it is to live in such an imagination before God, as if God were the landlord who lets us live a 'state of grace' as long as we pay the rent of our good behavior, instead of surrendering to the God who makes himself our servant and saves us precisely as the unworthy sinners we are, such that we might become liberated servants of one another. Here he is who bore much in many; here is the one who was killed in Abel and in Isaac had his feet tied, who roamed, a foreigner, in Jacob, was sold in Joseph, exposed in Moses, had his throat slit in the lamb, was pursued in David, and in the prophets dishonored. God's response to a broken and violent world is not to magically remove the suffering we have insisted upon for ourselves and each other--and thereby take away also the freedom which is his likeness--but to identify himself with it, that, if we consent to the salvation he is just dying to give us--literally--all the death we have purchased for ourselves might be destroyed from the inside by the divine humility joined to our humanity in the person of Jesus Christ. The appearance of Pope Francis is certainly a joy for Franciscans everywhere, for all of us who have found in the pattern of Francis of Assisi the fitting and fruitful way to live our Christianity. But it will also be a challenge. As I've mentioned, one of the tasks I've been charged with recently is the setting of the tables for the friars' meals. In the refectory, como Dios manda, are displayed four images: a crucifix, an icon of the Blessed Virgin Mary, and a portrait each of the Pope and the Minister General of the Order. 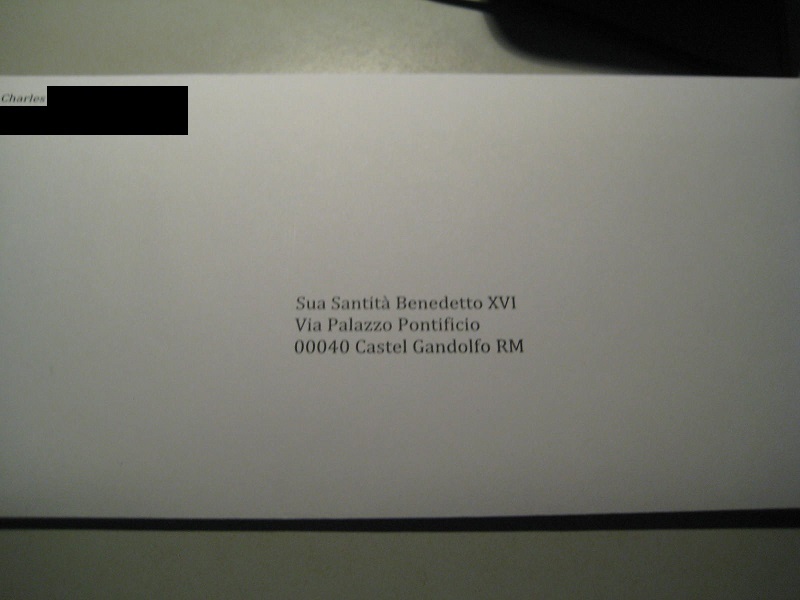 Back on February 28, I wondered if I ought to take Pope Benedict XVI down when I prepared the refectory for supper. After all, by the time the food was blessed and the brethren were getting their soup, his pontificate would be over. Qui sibi nomen imposuit Franciscum. In Italy, of course, 'Francis' can only mean one thing: Francis of Assisi. But--I thought right away--for a Jesuit, 'Francis' could just as easily mean St. Francis Xavier. But today I've read that at supper last night Pope Francis let everyone know that he was thinking of the former. And what a first impression Pope Francis made by asking the 'favor' of the prayer of the people--and bowing profoundly to receive it--before himself giving the blessing urbi et orbi. It was also striking, to me at least, how he only wanted the stole for the blessing itself. After all the clamor--around here at least--for the Franciscan Cardinal to be elected pope, we have been given a Pope Francis (who happens to be a Jesuit). Anyone accustomed to discerning the answers to prayer and the work of grace in his or her life will, perhaps, therein recognize a classic example of the Holy Spirit's characteristic behavior. May the Lord bless his servant Pope Francis as he begins his service to the Churches of God and to the world in which the Church finds herself in pilgrimage. This little moment with Cardinal Collins, which I saw this morning on Whispers, is too wonderful--on various levels--not to repost. Maybe it's a random thing to rant about, but I was disappointed with the first black smoke of the Conclave last night. Not that I expected it to be anything but black, but it just seemed to be a little over the top in its volume and blackness, billowing away long after everyone had gotten the point. I don't think anyone would accuse me of having good manners, but I am good at remembering to write a thank-you note. It was good to be on retreat this past week, especially since by my most grievous fault and given the transition, I missed my annual retreat last year. What can I say? In the end I'm not a very good religious. "I can see that you are a spiritual man." "What do you mean?" asked the first brother, looking a little concerned, perhaps--like Mary--wondering what this greeting might mean. "They say that eating spicy food stirs up the passions in the body, so I can see that you seek a fiercer spiritual combat as a greater sacrifice to offer to the Lord." Dear friends, I am on retreat with the brothers for the coming week and so there will be no new posts nor comments moderated for at least that long. Thank you for the kindness of your prayers, as I will pray for you. Here in Rome, of course, the pope is our local bishop, so as of suppertime last night we have neither. That's a new situation for me as a Catholic. There's only been one other papal interregnum since my baptism, that of April 2005. In those days I was living in Boston and we were very happy with our local bishop, the still only recently arrived and not yet Cardinal Seán Patrick O'Malley. Fortunately, by divine or human design (or some mysterious combination thereof; oh, the mystery of Christianity!) the friar to whom it fell to be first concelebrant for Eucharistic Prayer II this morning was not only a real Italian (though a Milanese, not a Roman) but also someone who seems pretty careful about liturgy. il nostro Vescovo N., e tutto l’ordine sacerdotale. together with N. our Pope and N. our Bishop and all the clergy.